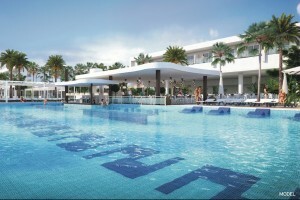 Signature Vacations reports the newest addition to RIU Hotels & Resorts, the five-star Riu Reggae in Montego Bay, Jamaica will open in November. When it opens in November 2016, the resort is expected to offer both a serene setting for couples and newlyweds, as well as an attractive base for singles and groups looking to combine beach relaxation with excursions of the island. The resort will featuring three infinity pools, including two swim-up bars, complimentary Wi-Fi throughout, concierge service, fitness centre, steam bath, whirlpool and a Renova spa, including a beauty parlour and massage service. Dining options are varied and include three à la carte restaurants specializing in classic Italian dishes, succulent grills and a specialty Asian restaurant. The resort’s main restaurant provides a more relaxing dining experience daily, together with offering live cooking stations every day and a themed buffet three times a week. Guests can also take advantage of a wide range of complimentary non-motorized water sports such as windsurfing, snorkelling, kayaking and an introductory scuba diving lesson in the pool. In addition, the resort also offers RiuFit, a complete exercise program designed to help keep guests healthy and active while on vacation. A nightclub and nightly program of live music and shows are also available. Signature Vacations’ guests benefit from a host of RIU-topia inclusions when they stay at a RIU resort, including unlimited dining and drinks, discounts on select excursions, in-room liquor dispensers and spa credit among others. A week at Riu Reggae is available from $1,395 plus $475 taxes p.p., based on two people sharing a Standard Room on an all-inclusive basis and departing from Toronto on Nov. 21.